When I got to the Gathering I got my name badge and a goodie bag full of freebies! The goodie bag had some card games (including a special Tichu deck with new pictures of people who have attended the Gathering in the past), some expansions to other games (like the expansion to fellow GAC member, Roberta Taylor’s Octopus’ Garden) and even the full box version of Two by Two from Valley Games (and designed by fellow GAC member, Rob Bartel!). The name badge system was awesome as they were colour coded to help you identify people a lot easier. With this information it was easy to identify the publishers as you walked around. Red Badge: First year attendee (so I had a red badge!). Generally speaking, red badge attendees are always welcomed by others and made to feel at home pretty quickly. People were constantly shaking my hand and welcoming me to the Gathering. It was very nice! After I got my badge, I surveyed the layout. 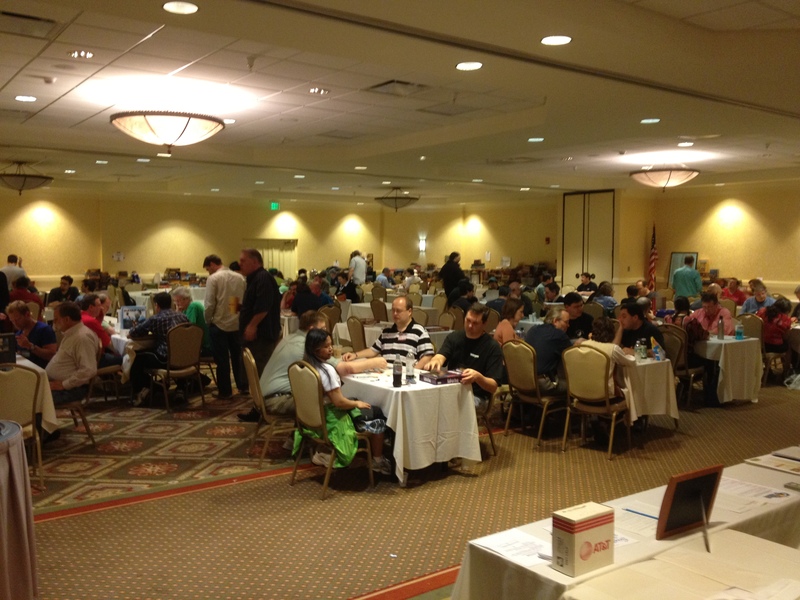 Basically there was a large convention room with tons of tables set up for open gaming. Off to one side were the prize tables! Everyone was encouraged to bring something for the prize table. If you contributed to the prize table, then you could participate in the prize draw at the end of the Gathering. Near the Prize tables was a table full of brochures for local restaurants and more freebies. I found an expansion to Valdora and another for Mondo there! Around the edges of the room were tables where people stored the games they brought. 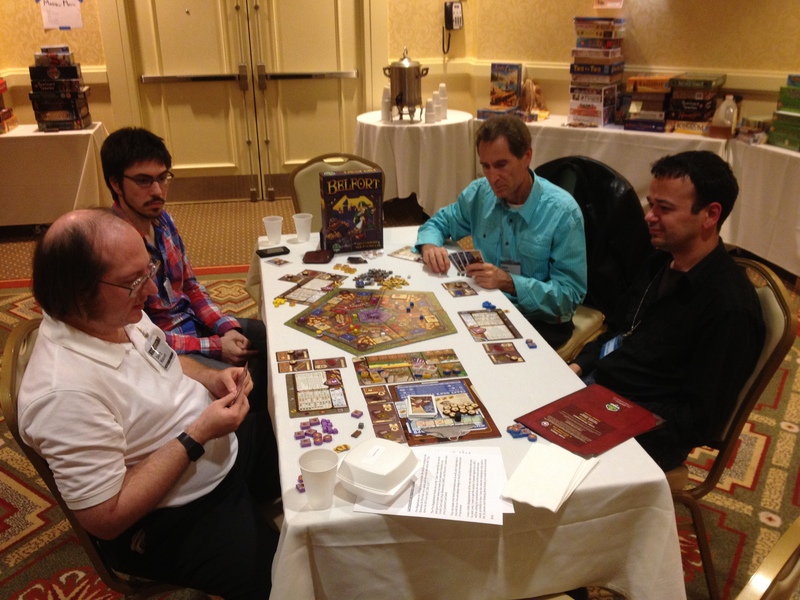 Oh look, Pierre Poissant-Marquis (right), half of the design team of the game Quebec is playing Belfort! Generally speaking, anyone could grab any game and start playing at any time, as long as they returned it when they were done with it. Outside of the convention room were a few open areas with more tables ready for open gaming. These tables were used for the poker tournament that happened on one night. Finally, down the hall there were a couple of rooms with a few more tables. During the day we found these to be a bit quieter and therefore made it a favourite spot for us to pitch to publishers. In the late evening one of these rooms were used for a large Werewolf tournament! There were always water stations all over the place to ensure you stayed hydrated throughout the event, so that was nice! On a whole, the hotel and its staff, while a bit gungy (the hotel, not the staff), were prepared and made us feel welcome. I found Rob and saw that he had a spot along the tables around the edges of the room, so I added my prototypes to his pile. Once we were set up then we were free to either start our own game, or join another group that’s about to start playing a game. It was always easy to find people to play a game of anything! Some of the times it would be a prototype and other times it would be a ‘regular’ game. There were a lot of designers there who, like Rob and I, were looking to get some feedback on their designs, as well as pitch to publishers. Friedemann Friese had a table dedicated to his games for the entire event. I wanted to check them out but never seemed to line up when the table was free. While the hotel offered a mini café in the latter half of the week, most of the meals were either at TGIF, which was in the same hotel, or a restaurant in the casino across the street. Sometimes people with cars would drive others to another local establishment nearby (Duff’s Buffalo wings!) or a few times we walked to a nearby Indian restaurant. Even though I stayed up late on some days (3am) and woke up early on other days (8am), there were always people playing games somewhere in the convention area! Sleep is for chumps! There were quite a few tournaments throughout the week ranging from 7 Wonders and Tichu to Loopin’ Louie and poker. 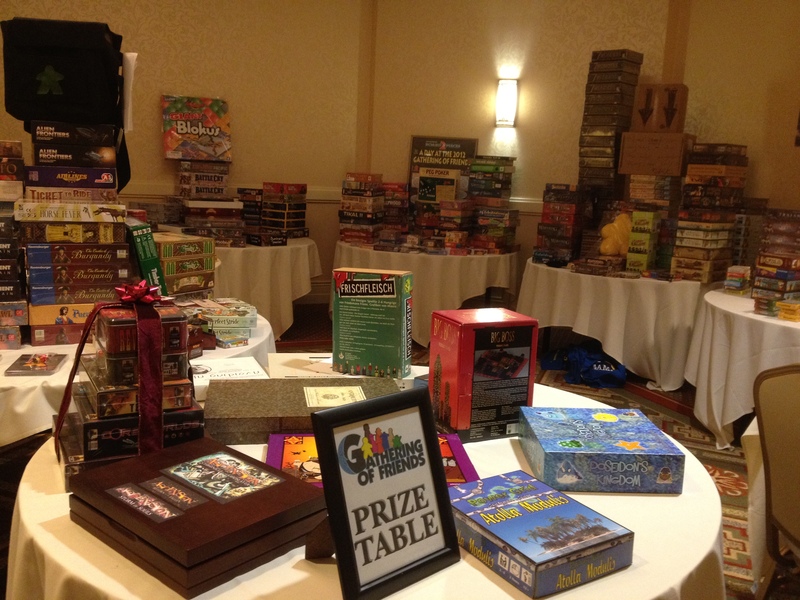 The winners of each tournament got first choice of the prize table on Saturday night! Before the prize ceremony there was a flea market. Those that could travel with their assortment of games offered them up for sale to the rest of us. Since most people had to fly, it was a tough decision on what they could buy and what they could pack! I managed to pick up a copy of El Cabellero – a Wolfgang Kramer game that is out of print and one that I’ve been looking to get for a long time now! The Cookies of Catan – a fully playable and edible game of Settlers of Catan! Line for Life for an upcoming game called D-Day Dice (designed by another fellow GAC member, Emmanuel Aquin). The Line for Life meant that the person would receive every expansion they ever make for this game for free! I was called somewhere in the middle of the pack, but I managed to get the exact game I was hoping to pick up – Castles of Burgundy. It was a game I had wanted to pick up in Essen last year, but they sold out too quick! Up next I’ll get into the specifics of what it’s like to pitch to publishers at the Gathering! Belfort Expansion and new review! Belfort is another one of those games whose genius lies in its simplicity while being tough to be good at it. Thanks for the review PGN! Secondly, we’ve been playtesting the Belfort expansions for awhile now, and I have to say that I’m pretty excited about it. We’re toying around with a couple of different ideas and we’ll be pitching them to the publisher soon to see which one we should focus on more. Rest assured that it probably won’t be what you’re thinking, as Sen and I prefer to mix it up a bit and be a little unconventional. We’ll be sharing a link with fans that want to get in on the playtesting once it’s approved by the publisher, so check back here in a few weeks if you’re interested in being a part of the playtest group! If you’re excited about the expansion then you can head on over and vote for it as an anticipated expansion for 2012. Boardgamegeek is holding a poll and you have until Sunday to cast your vote on which games and expansions you’re most looking forward to this year. Fortunately board games don’t suffer from the same kind of sequel-itis that Hollywood movies often do. In Hollywood, a sequel can and almost 100% of the time will get a green light based purely on the box office receipts of the first movie. 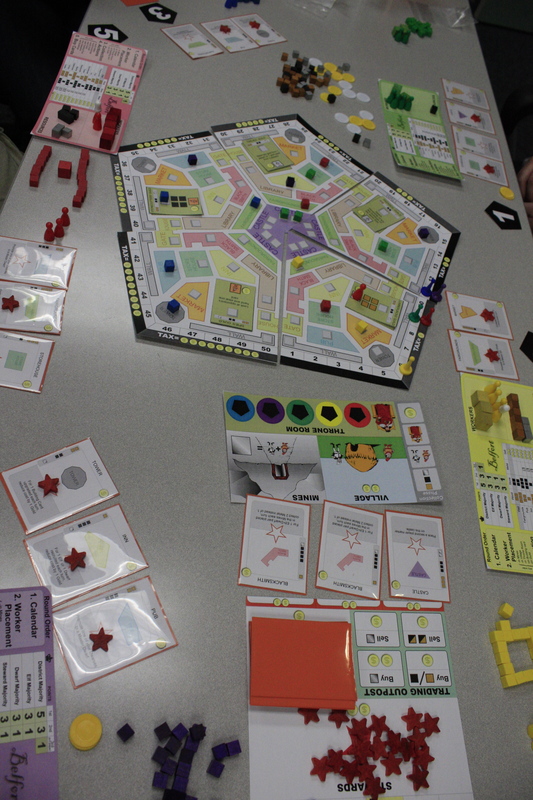 In the board game world, sales are harder to come by and are often based more on word of mouth (or reputation of a designer or publisher). It leads me to think that a game has to be pretty good to warrant that many sales. How many sales are needed before an expansion is warranted? An expansion usually sells between 25%-35% of what the base game sold. So if the base game sold 10,000 units, then you can expect the expansion to sell around 2500-3500. But what are the down sides to an expansion? Well, if it’s released too soon then some people haven’t had enough time with the base game to fully explore and experience it. I don’t necessarily think this is a bad thing, because there’s nothing making me buy an expansion (except for the fact that I really want to buy it!). I’ll just keep playing the base game until I’m ready to try the expansion. Some expansions can be looked at as a cash grab, if the quality isn’t there – but I find those to be few and far between in the board game world. In the end, I love expansions. It provides longer shelf life to your games by tweaking the game just enough to provide a fresh experience. We’ll spend another article discussing what makes a great expansion and what makes a poor one. For now, I’m just excited that Belfort has warranted enough interest to even be talking about the possibility of an expansion!! The contract has been signed, so now it’s time to sit back and wait until it hits the shelves right? Not quite. There’s still some work to do. Most publishers will spend some time developing the game even further. This is common and could last anywhere from a few weeks to a few months. The publisher might have a team of people that are responsible for developing the game or there might be just one person in charge of it. So what happens during this stage? Well, the developer plays your game over and over again, trying to see if it’s fully balanced and retains what it had when they first agreed to publish it. The most common thing that will happen here is small tweaks. The cost of one card could be made more expensive as it proves to be too powerful in their tests; the quantity of resources given out might be changed for balance reasons. It could be bigger changes that range from adding or removing certain aspects or even changing the theme of the game! 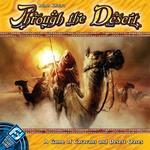 A famous story is how Reiner Knizia’s game, Through the Desert started as a game about campers. The publisher liked it but wanted to change the theme to camels in a desert – and the rest is history. We were fortunate for this stage so far as we were involved in all suggested changes. Most of them were fine by us, but once in a while we would share our thoughts on why we would disagree. Sometimes it was because we had tried that in an earlier prototype and found that it didn’t work in the long run for various reasons. Most, if not all of the time, the developer listened to what we had to say and took action because of what we said. For example, at one point we suggested starting players with some resources, and while at first it was thought not necessary by the developer, we eventually playtested it and found that it sped the game up considerably. Alternatively, we always had a rule in there that you could sell your buildings for a certain amount of gold. Eventually the developer realized that hardly anyone ever did that, so it was better to just remove it which removes 1 option players have – which is fine in this game as there are plenty of other choices to be made! For us, the developer process was lengthy for Belfort and almost non-existent for Train of Thought. 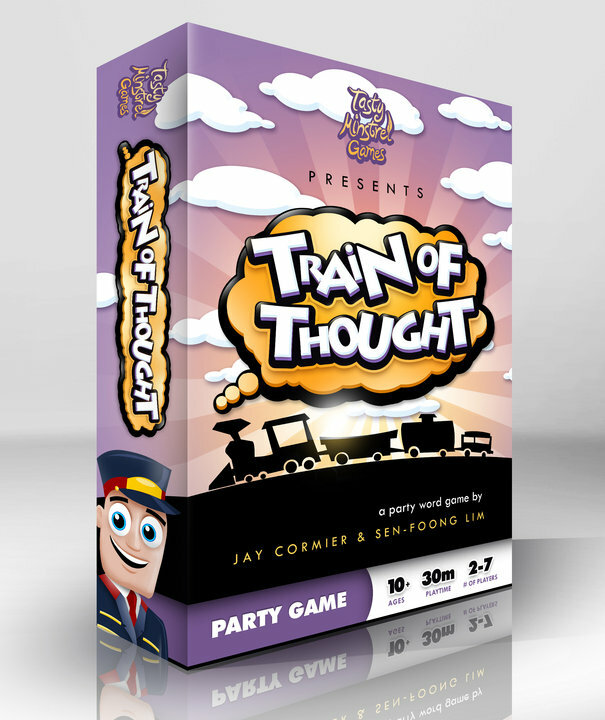 Train of Thought is a party game and it didn’t require any changes at all. The only development for that game came with the rules editing. 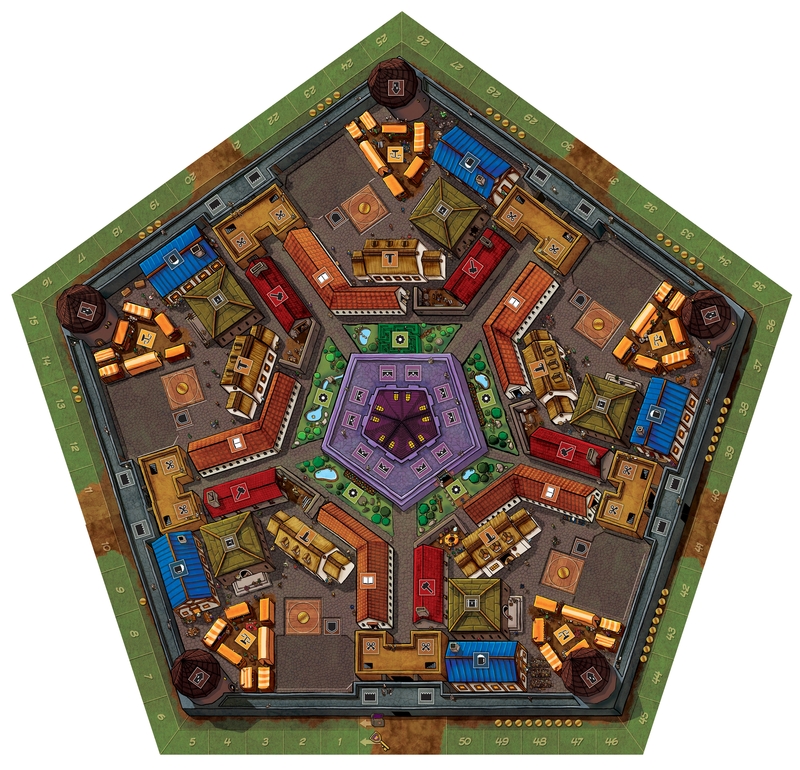 Belfort is a deep strategy game and the developer playtested the game numerous times over the 6 months. Every few weeks we’d get some new reports on how the latest playtests were going. We communicated using an online forum since we were all located in various parts of North America. It’s key in this stage to maintain a positive attitude and a humble demeanour. You don’t want to get on the publisher’s bad side at this stage. If you want a reputation, then get one that is about how easy it was to work with you as a designer. That isn’t to say that you should just lay down and accept everything they suggest. We chose our battles wisely and only really stuck to our guns if it negatively impacted gameplay. This should be one of the most fun times for you as a designer, so don’t spoil it! When not creating games by night, I’m a mild-mannered pediatric Occupational Therapist by day. In my line of work, I constantly tell parents that a huge percentage of the problems they or their children are experiencing could benefit from improved communication. And the same goes for working with a developer – fostering an open and understanding dialog is key to ending up with a result that everyone can be happy with and proud of. Because Jay and I work as a team though, painfully separated by huge tracts of land, we have become somewhat experts in communicating with each other. For the most part, we are able to get our points across without ripping each other’s throats out. Having access to modern technology like Skype and our forum has really enabled Jay and I to be able to do our work despite the 3-hour time difference. We have become fairly adept at putting our ideas into writing, making physical prototypes and working things out from a distance. Giving and receiving feedback with our colleagues from the Game Artisans of Canada and our playtest teams has been hugely beneficial as well. All of these skills have been definite assets when it came to working with Seth Jaffee, our Developer on both Train of Thought and Belfort. So, working with a developer is no different than working with anyone else – communication is a game. Everyone playing just needs to know the rules, the boundaries, and share a common lingo. What I mean by this is not necessarily the rules of the game itself (though you should know those like the back of your hand, I hope!) but the “rules of engagement”, as it were. Questions you need to answer may include: Who’s in charge of what? Who’s tasked to what? Who’s the final decision maker? What is the purpose of this iteration cycle? Arming yourself with this knowledge can help you avoid some of the common misadventures that happen with groupwork – Going It Alone, Reinventing the Wheel, Passing the Buck, and the ever-dreaded Stepping On Toes. Fact 1: You are designer of the game. So it’s your baby. Fact 2: You have signed away your rights to the game. So it’s basically been “adopted”. This means that you need to understand a few things, like it’s the publisher’s call whether or not the game needs to be rethemed. It’s the publisher’s call whether or not there are too many cards in Deck A, B *and* C. And, thus, by proxy, it’s the developer’s call as he/she has been employed by the publisher to take the game and make it better suit the publisher. You need to be aware going into this relationship that the developer is not there to work for you. He has a different agenda. It’s more than likely 99.9% parallel to yours, but you’ll note that I used the word “parallel” as opposed to “same”. He may have the task of ensuring that there is the least amount of language on the cards, for example, which requires you to review how the rules work with only icons. Your agendas need not clash – in the end, all parties just want to make a good game. But it takes an understanding on all sides of the die that everyone knows what’s up. Speaking of which, one boundary that you, as the designer, may wish to discuss with the publisher and developer is your overall vision for the game – what were you trying to accomplish when you made the game? What are some of the high priority “no sale”, make-or-break items for you? If the developer holds these in mind while he is doing his thang, everything will flow from those overarching elements. It’s important to look at the game from the macro viewpoint every now and then to ensure that the wholistic nature of the game is still intact after all of the micro changes that are made. But without talking about that kind of stuff, how is the developer supposed to know? He’s not a mind-reader anymore than you are. This, simply put, means that everyone is on the same page language and terminology-wise. You will save yourself a lot of confusion and arguments if everyone knows that when you say SP you’re referring to Skill Points, not Spell Points. Having very clear rules with well-layed out phases of play and a glossary of terms can really help everyone understand each other. When everyone speaks the same language, the flow of ideas is much more seamless. It helps streamline conversations when people can refer to the same points of reference instead of having to call something the “the-part-of-the-game-where-we-roll-dice-and-move-things-but-we-don’t-pick-up-any-cards-because-that-comes-at-the-end phase” (er…you mean “The Movement Phase”). So keep the lines open between you, the developer, and the publisher. In the end, change is generally for the positive – i.e. to make the game better (in terms of playability, saleability, etc.). Be open and accepting to feedback, because if the agendas are parallel, everyone is hoping to get to the same place. So embrace change instead of fighting it, just ask for clarification/explanation from the developer if needed. Well, to say 2011 was a big year for the Bamboozle Brothers (that’s Sen and I, btw!!) would be quite the understatement! In 2011 we saw the release of our first two games! 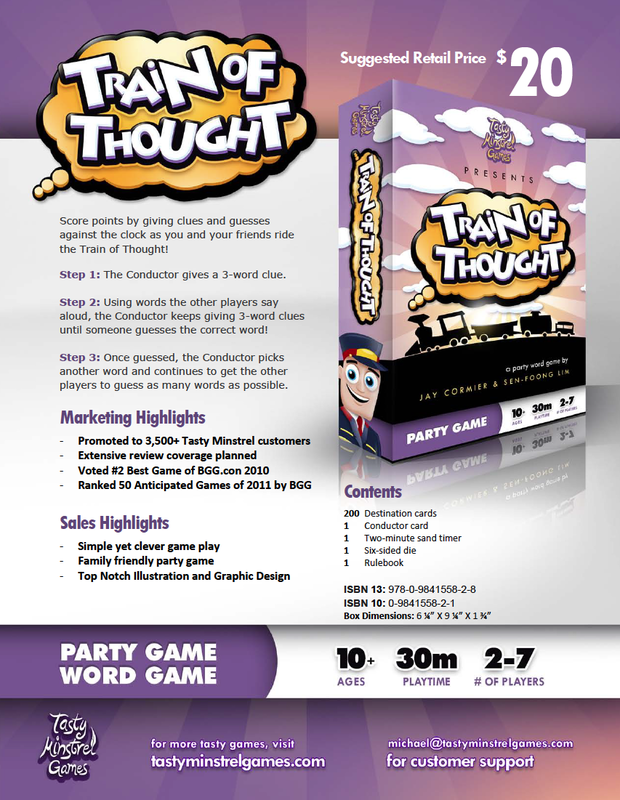 Train of Thought was our first published game (though it was our second one signed to be published). 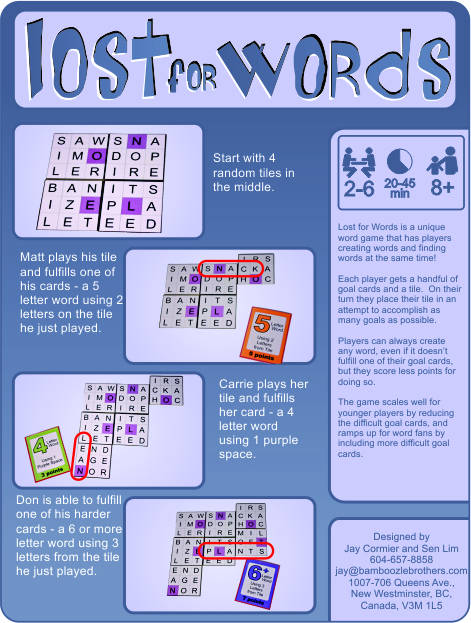 It’s a party game that gets people thinking differently than most other party games. It has been reviewed very well so far. There are discussions with other publishers to see if there’s interest in publishing the game in different languages and different countries. We managed to get it into a National Retailer in Canada…yep – Train of Thought is available on Bestbuy.ca! Belfort was released just a few months ago and has been received extremely well by gamers everywhere, including achieving the number one game of this year’s BGG.con. It has sold out at the publisher level, and they are in discussions with other publishers to see if they want to do other language versions of the game. On the last day of 2011, Belfort was the 392nd best game of all time, according to users on boardgamegeek.com. We’ve seen it pop up on a few top ten lists of the year as well. It has already been confirmed by the publisher, Tasty Minstrel Games, that an expansion will come out next year! Expansion you say? Yep! Sen and I have been working hard on many expansions for Belfort. Tasty Minstrel has given us carte blanche in creating it – so we thought we’d come up with a few and either have them choose – or, if they like them all, then stagger the release of expansions over the next couple years. It was also a big year for our unpublished games! How so? Well, 8 of our unpublished games are currently out at various publishers being reviewed. 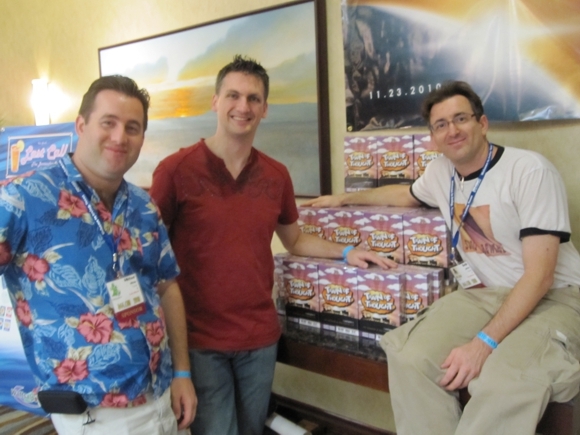 My trip to Essen (detailed in many posts starting here) was key in getting most of our games out to publishers. We’re feeling some good vibes from at least two publishers about our games and we should start to hear from most of them in January. One of them, Akrotiri, made it to the finals in the Canadian Game Design Competition that was ultimately won by fellow Game Artisan of Canada’s Matt Tollman with his game, Undermining. Sen and I took one of our almost-published games, But Wait, There’s More and posted it here on our website and gave it away for free to everyone! It has also been posted on boardgamegeek.com – so I guess it’s actually a published game now! If you’ve downloaded and tried it, we’d love to hear your feedback. Expect more free games from Sen and I in the near future! Sen and I belong to the Game Artisans of Canada (GAC), and it’s been an amazing organization and very symbiotic relationship so far. There are chapters of game designers all across Canada that get together to playtest each other’s games and help each other out with general questions and direction. The collective knowledge of the group is astounding, let alone the numerous contacts that each person brings to the table. You can read more about the group, including its annual get-together, appropriately named Cardstock here. 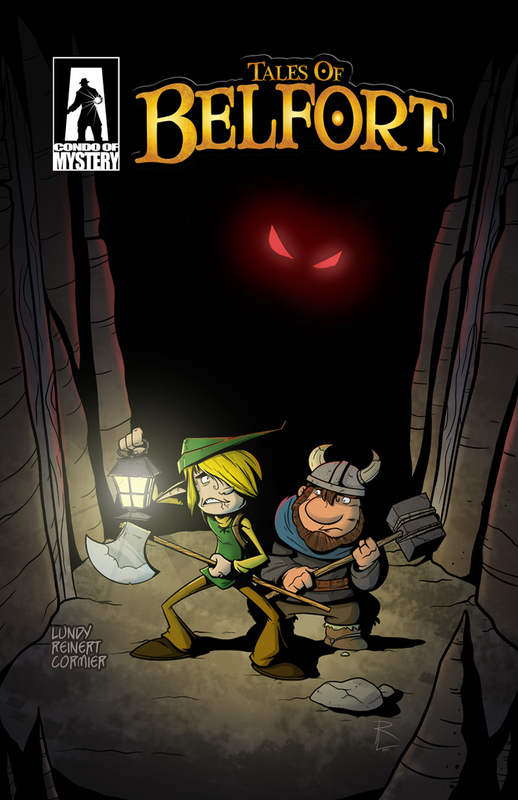 We also released our first comic, which was set in the world of Belfort and was written by me and my comic-writing partner, Tim Reinert and illustrated by the uber-talented Rob Lundy. We’ve started a path that was very similar to the path Sen and I took on getting a board game published: we have no idea what we’re doing, but we’re taking it one step at a time and enjoying the process a lot! The entire 10-page Tales of Belfort comic will be complete by Monday or Tuesday of this coming week, then we’re onto other stories set in other, non-board game worlds! Check it out at Condo Of Mystery.com! It’s always interesting to see if people are reading what you’re writing. One way to tell if you’re connecting with your audience is if your posts start a discussion (go on, comment below! ), but the other way is through analyzing the stats. It’s rewarding to me to see that people are visiting the site as often as they are. What’s the plan for 2012 for this blog? Well, there are still a few more steps left to go to fully complete the journey we started long ago. Plus, since starting this blog, we’ve come up with many more tips and best practices along the way that we’ll have to squeeze into the step process somewhere. Not sure how we’ll do that…maybe just renumber the steps? We’ll see. Plus we’re hoping to get some experiences with different publishers under our belt this year. No problems or challenges with our current publisher – but it will be interesting to see how other publishers operate. We also have plans to put some videos together that better demonstrate some of the steps that we’ve described. As usual, we’ll be as transparent as we can be – we have to hold back sometimes when publishers request us NOT to post about certain things – which we can understand. Usually it’s just a timing thing and not a forever thing. So what else is coming in 2012? We hope a few more games from the Bamboozle Brothers! While the publishers are assessing the games of ours that they have right now, Sen and I are still working on new games (it’s really a never ending cycle, isn’t it – no complaints here though!). We have Lion’s Share, RuneMasters, Scene of the Crime and more that haven’t made it through Beta stage yet. I am really looking forward to April as I have been invited to the very exclusive Gathering of Friends! This is a week long event held by famed game designer, Alan Moon in which his friends (most of them are other famous game designers) and some publishers show up and play games all week! Wow! That’s going to be amazing! Sen is planning a trip to Essen this year to celebrate completing 4 decades of living. I might go as well, but the Gathering will take a fair bit of change out of my spending this year. 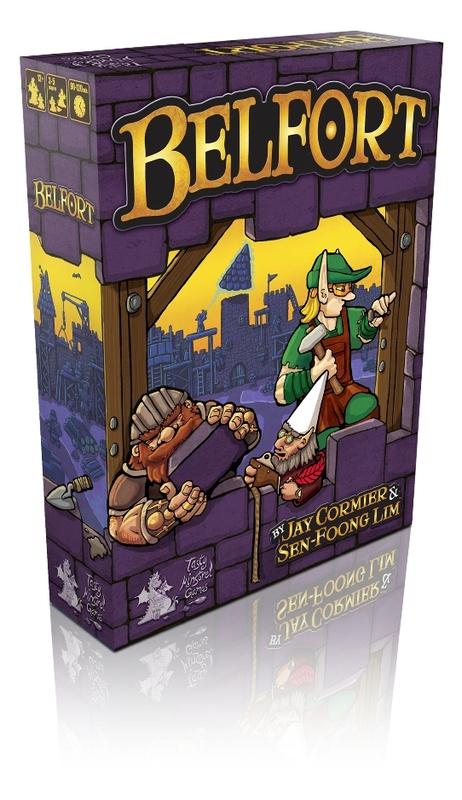 The aforementioned expansion to Belfort will be released. Expect the first expansion to be one of the smaller kind of expansions – not a full boxed version. Just something to mix it up a bit! I have to say that five years ago, I would never have thought I’d be where I am right now. It’s been a fantastic ride, and I can’t wait to see what next year has in store for us! Thanks for joining us on this trip! Now that I’m not an Essen noob, I have some tips and best practices for those that want to visit Essen in the future. I’ll be sure to re-visit this post as next year draws near. Book your hotel well in advance. Stay close or at least on the metro/subway line. We spent too much money on taxis though there were 4 of us so we could split the fares. 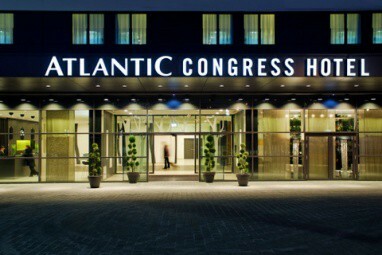 Next year we’re thinking of staying at the Atlantic hotel as it’s within walking distance. Pack a luggage within your luggage. If you’re planning on buying a bajillion games, then make sure you’re prepared to get them home! Most flights out of Duseldorf (closest airport to Essen) will charge you 50 Euros for an extra luggage, so factor that in you decisions about which games you should pick up. My rule was that if I could get it in Canada, I wouldn’t buy it at Essen, no matter how cheap it was. 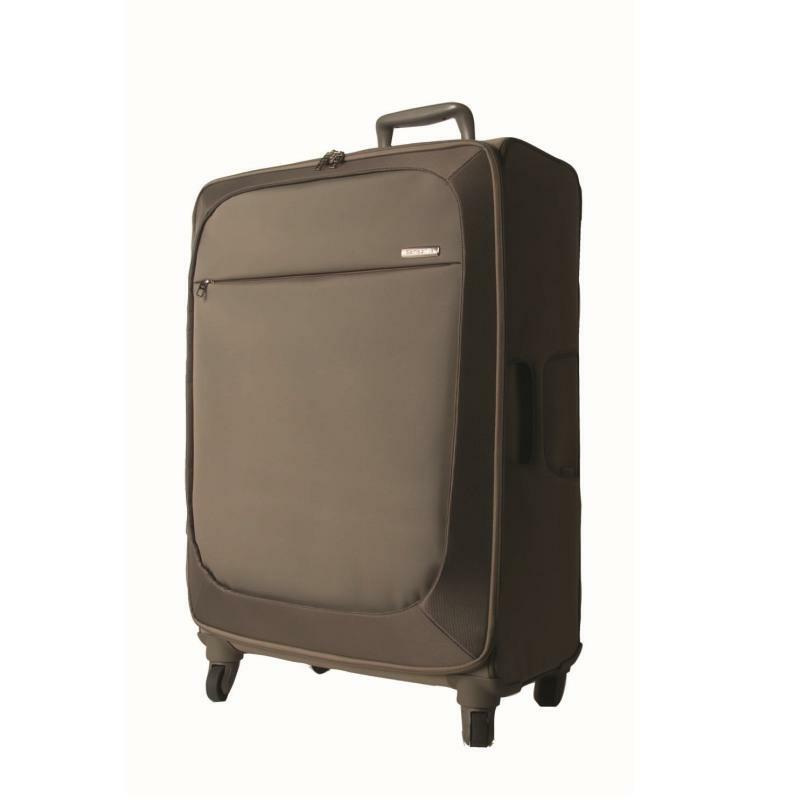 Bring an empty rolling luggage with you to the Fair. Carrying games around all day can get tiring. One of the Game Artisans of Canada was smart and brought a rolly suitcase and made it super easy to carry games around. There were many other ‘smart’ people who did the same. I used the bags provided by the vendors and had 2 paper bags rip on me in the middle of an aisle. Boo! Create a list beforehand of the games you want AND add the publisher name and booth number to the list. It’s not easy finding games if you don’t know the publisher – but it’s super easy if you know the booth number. Bring a healthy snack if you can. The food options at the Fair are the usual hot dogs, pizza slices and Nutella-filled crepes. And they’re not cheap either – so brings some edibles and come well-fed already. If you’re going to split up with your friends, make sure the meet up point is very clear. Some publishers have multiple booths so that can get confusing! We had a meeting with a publisher who said to meet him at the Snack Point in Hall 6. After 2 very crowded loops of Hall 6, we couldn’t find any Snack Points. Apparently there was one there last year and he was basing the location from last year’s layout! No one can tell you which games you should or shouldn’t get, but pay attention to forums and buzz to find out which might sell out before others and plan to get those sooner than later. 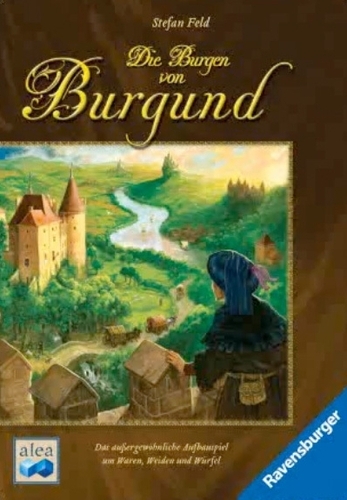 I really wanted a game called Die Burgen von Burgund and since it was a game that debuted last year, I figured that there would be plenty – however it still has not been published in America so it sold out right away and I never got a copy. Travelling to Essen from the Dusseldorf Airport will cost you 50 Euros in a taxi or you could take a train for about 4 Euros if you know how to get where you’re going. I actually went a few days early and went to Paris – so I took a train from Paris to Essen and then a cab from the train station, which was only about 12 Euros. On the way out I decided to incur the cost of a taxi because I wasn’t sure of where I was going (poor planning) if I had to take the train, and my foot was sore with some sort of heel spur. Contact publishers 1-2 months in advance of Essen to book appointments. Basically, the bigger the publisher, the earlier you should be setting up meetings. Email contact should suffice. Carry all your prototypes around with you – at all times. You never know when you’re going to need them. Always carry around a Sales Sheet for each of your games. If for some reason, you can’t or don’t want to carry around your prototypes – then at least always have a Sales Sheet on hand. I’ve definitely had to pull out a Sales Sheet at unexpected times at conventions. Make sure each game is individually packaged. I used a large baggie for each game. When we send a game to a publisher, we’ll always put it in a nice box, but at Essen I was carrying 7 prototypes with me at all times and there wasn’t room for each of them to have boxes. They all fit in my backpack once I put them each into their own baggie. Of course ensure each baggie is labeled with all the pertinent information: Name of game, your name and contact info and even the basic playtime, age range and how many players your game can support. Know the publisher before meeting with them. Actually you should know the publisher before you even email them. But when you’re in a meeting with a publisher and they reference one of their games, you should be familiar with it. That should ensure you’re prepared for a solid Essen adventure of your own. 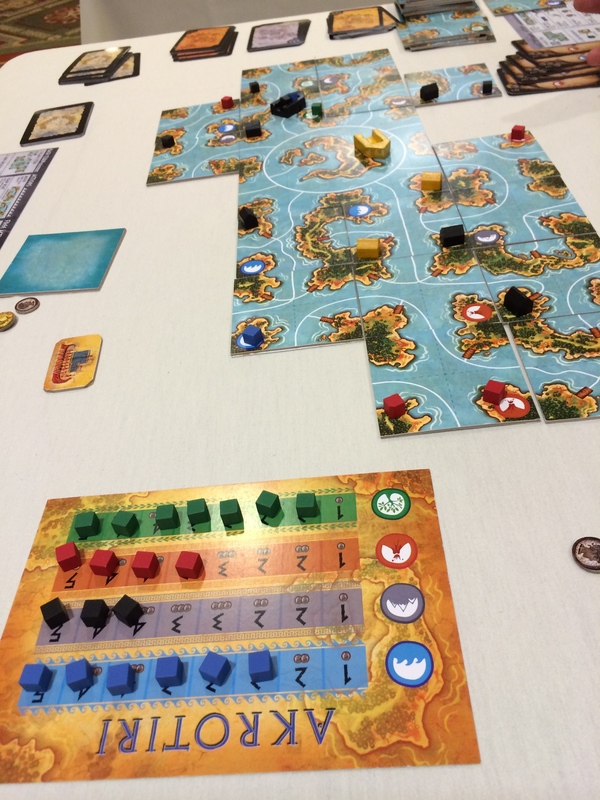 Next up I’ll regale you with a post about all the games I got at Essen!